Hagi’s return from Fiorentina: is it a transfer or a ransom? Not the usual “return of the prodigal son” story… Sold to Fiorentina in the summer of 2016, at a time when several options were on the table, Ianis Hagi returns to his father’s home a year and a half (and several shattered dreams) later, as FC Viitorul announces the agreement between clubs regarding the transfer fee and future percentages on its’ official website. Everything is settled, again, but there’s more relief than happiness for each side involved, in between the hidden numbers of this second deal. Hagi, the Great Hagi, suffered immensely seeing his son’s struggles in Firenze. Hagi, the still too small and fragile Hagi, had also a shock. He had the name, the talent, the promises – which his father prized more than the transfer fee itself – of first team football, but he got instead little in return. Less than an hour of football for Fiorentina’s 1st team, under Paulo Sousa, not a single minute under Pioli, it was quite clear that only a miracle would have changed quickly the fortunes of Ianis, who will turn 20 this year and has dropped from regular starter in the mediocre Liga 1 to just another talent who needs to impress at Primavera level. His father decided to put an end to it, at any cost. Is it another failure of a talented Romanian youngster abroad? Was it all too easy for Ianis, growing at his father’s club and under his continuous protection before the move to Italy, in the first truly competitive environment? Is it the right move to drag him back to Liga 1? What’s better: staying and fighting for his place in Firenze or getting back confidence and match fitness near Constanta? 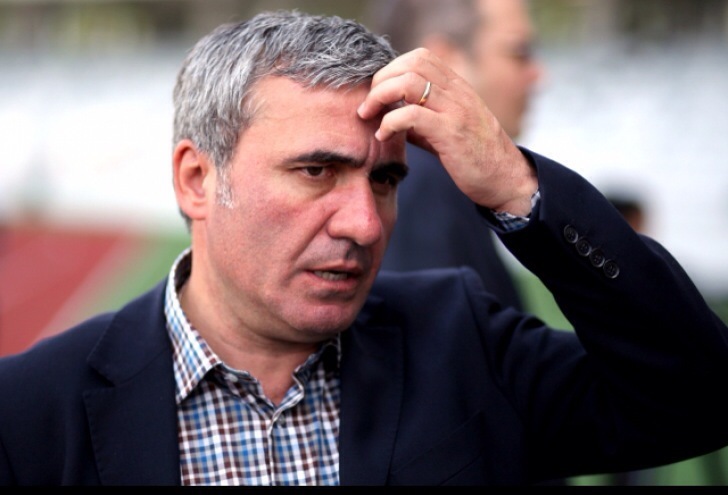 Would any other father had reacted any different if he had Hagi’s means and options, seeing their son in such difficulty? Lots of angles and questions to a very delicate situation indeed… It’s obvious and admirable that Hagi is trying to help his son, let’s just hope that being over-protective won’t turn Ianis into an under-achiever, never ready face and push through difficulties that have always separated the men from the boys and the performers from those with unfulfilled talents. Champion with Unirea Urziceni, Petrescu returns to Romania after some odd and unsuccessful spells abroad. A new ownership, strong investment to clear debt and massively overhaul the squad and the signing of a proven coach like Dan Petrescu surely turn once again CFR into a serious title contender. This is the club FCSB should / will fear the most. Petrescu knows exactly what he’s doing and what he needs, while the board has a proven record and a broad perspective over the market. They’ve already signed a dozen of new players, yes, there will be a lack of cohesion in the first part of the season, but if things go right, in a couple of months CFR will look a lot like Unirea Urziceni: a very experienced outfit, very well balanced, whose main assets will be mental, tactical and physical. At this point, I’d tip them to become a dominant team and wouldn’t be surprised to force FCSB into another handicap start in the play-offs. Contra’s arrival just before the start of last season’s playoffs produce an incredible effect, but it was all down to the former international’s excellent motivational ability. It will take more than that to really challenge for more than a place in Europe, mostly because Dinamo’s has a rather minimalistic approach on the market. The ownership’s reluctance to spend on transfer fees and big(ger) salaries is well-known, so the feeling is that Contra, who lost two key players already in Dielna and Palic, will have to perform miracles to mount a title challenge, unless re-enforcement is on the way. There’s a new, intriguing name on the bench: Devis Mangia. A new stadium should be completed within a year and Craiova – who rely on a passionate fan base – could get a major boost right before the play-offs. All the important players have stayed put so far – although the likes of Ivan and Baluta have the potential to attract bids – some interesting additions like Roman and Barbut came in, but the squad still feels too light to go all the way. Last season’s champions have surprised with the addition of some very experienced players, but hopefully Hagi won’t turn his kindergarten into a retirement house. He’s surely hoping that this strategy will help him make a good start in Europe, as the important clubs seem to remain reluctant in submitting the kind of bids he was expecting for hot prospects like Coman or Nedelcu, after their displays in Liga 1. It’s going to be almost impossible to repeat last season’s feat, but an European spot remains on the cards and in Hagi’s plans for the campaign set to start on July 15. Razvan Marin left the surprising league leaders Viitorul, second placed Steaua lost two key players in Popa and Tosca, while Craiova parted ways with team captain and regular left-back Vatajelu, managing to resist attempts from abroad for their highest asset, Ivan. Heavily weakened from the chasing pack comes out Dinamo, who sold Rotariu and Lazar and finally parted ways with Gnohere, all three attacking men that will be difficult to replace in a team that is yet to be sure of its place in the playoffs, with former champions Astra knocking at their door, in spite of all the torments that probably would have killed any other club by now. From a sporting point of view, everyone comes out weaker from this long winter break, considering that only Steaua had – as always – both the money and desire to re-invest, bringing in a lot of firepower in Alibec and Gnohere, two physical strikers who promise to brush aside weak and deep defensive lines, but who could need time to adjust. Leaving aside their proven quality in the league, shall we try to go back until we find a regular scorer for Steaua in the no 9 role? The competition will be weaker, no doubt, but the teams that will make it into the playoffs should attack the final stretch of this league that suddenly became interesting again for European clubs from fairly even positions. There’s a lot of ambition in Craiova, but their coach has rarely managed to keep his team (and often his own job) for an entire season, in spite of often very promising spells. Gaz Metan was the surprise package of the first part of the season, but they’ve lost their main scoring threat and the insolvency that will keep them from playing in Europe is anything but good motivation to keep going. No prediction from me, but hopefully Viitorul and Craiova can take into the new year their ability to win points often by taking initiative and playing attacking football, with Steaua’s aura losing its strength even more in recent months. The pressure is on and, come summer, Becali’s club could lose both a title that nobody was looking able to challenge at the beginning of the season and its famous name. Razvan Marin joins Standard Liege. A good move for everyone involved! Fans of Standard might know little about him, but what’s important from them is that the club’s board made a smart, justified (it was about time, right?) move by going for his signature. Marin is the brightest and most consistent young player in Liga 1, is younger and a lot cheaper than Anderlecht’s huge transfer from the same competition six month ago (Stanciu going at 23, with less re-selling potential for an absurd transfer fee) and will find in Belgium a competition that will challenge and help him develop. Linked previously with clubs like Zenith, Roma or Fiorentina, Marin will find with Standard the much needed playing time at this age and in his first adventure abroad and I have a feeling that everyone involved in this deal can look back smiling to this very moment in a couple of years. Having just lost Trebel (25), Standard nailed a central midfielder with a rather similar profile, who can add more going forward, but who needs to progress physically and mentally to reach similar levels in the defensive phase of the game, especially if Standard will continue to use a 4-4-2. To conclude, Standard gets a 20 years old with a lot of first team experience,who has made an impact in Romania’s senior national team and has every reason to add caps to his name with consistency, who is already on the radar of some big clubs and who was signed at a realistic price, which ensures quite a big margin for profit if Marin does impress. Marin, on the other hand, has no reason to be down for missing out on the speculated transfers; he takes a step forward, will play in a league that posed problems to fellow internationals Chipciu and Stanciu at Anderlecht, both more experienced than him, and won’t need to fight the same level of doubt when scouts will be sent to (re)asses his level and potential. He’ll get to learn, to play and to taste football abroad with all the challenges that have seen similar Romanian talents waste important years in bigger leagues and clubs. He has the mentality and ability to see this through and be more prepared for what everyone thinks is his future. Viitorul started its third consecutive season in the top flight, which is quite a feature considering the impressive number of youngsters promoted, but also the difficulties to survive in a league full of clubs ready to throw everything into a fight that usually has one true victim: the future of Romanian football. Hagi entered this fight with his best kids and intentions, but soon realized all his work and huge investment – done mostly by himself – can go to waste, so Viitorul has now linked to its name some shocking, yet very useful results obtained at the very end of the previous two Liga 1 campaigns. It was not pretty to watch and it surely didn’t send the right signals not only within the club, but also outside of it. But what father wouldn’t try everything to protect his children? The real problem, in my opinion, is not that Hagi felt the need to intervene, as he does now, by taking an active role in the technical staff of his own club, is that he failed to address some important issues, which regard both the Academy’s activity and the senior team’s results. 1. No real solution for players who turn 19. The youth competitions – which Hagi’s Academy dominate for years – involve only players up to 19 years old. Once the youngsters reach this critical age in their development, there’s no Under 21 or Reserve League games waiting for them. Hagi probably hoped to address that when he supported Gheorghe Popescu’s candidacy, but the former Barcelona captain ended the race in jail, not in the Romanian Football Federation’s best office. There was no plan B. There are no partner-clubs in the second division, there are no friendly relations with other Liga 1 clubs, where most of his 19 years old, champions at youth level, could have a chance to take the normal step towards senior football. Viitorul is the only senior club to aspire to and it simply cannot look after and promote every generation of new players that comes out of the academy each year. 2. Too much confidence in the Academy’s potential to promote itself. Initially, Hagi didn’t want a club in the tip flight, but was forced to push for promotion, as he felt that the second division is not a glamorous shopping avenue for interesting clubs, not even Romanian 1st division teams. He had to stop the investment in the training facilities near Constanta to be able to finance the club, but I am not sure that things are that much better. A look at some of the top sales done so far? Chitu to Valenciennes (failed to adjust, now returned to Romania), Balasa to Roma (loaned in Serie B), Iancu to Steaua (failed to impress)… Not very good advertising, is it? 3. Poor marketing and reluctance to work with agents. Probably Hagi relies on his name, on the impressive number of youth internationals (the U21 just lost 0-8 to Germany…) and surely lacks in his club structure the people who can attract and keep alive the little interest of foreign clubs. On the other hand, he also ignores the good (which often comes with some bad, but not always!) that can be done by agents who know how to sell players. Anyway, having young, unexperienced and not so strict coaches in charge of a young and unexperienced team might not be the best idea, but until proven wrong, it seems like the only and the best idea. Viitorul works every day with something than can be seen, felt in a player, but that cannot always be transformed into quality. It’s a process that involved hundreds of players since the academy opened its doors, thousands of hours spent on the pitch, millions of Euros invested and a bunch of subjective factors that can influence the outcome and make the work at youth level such a massive task which most of Romanian clubs simply refuse to undertake anymore. Why Viitorul, who produces talent in quantities way over the senior team’s needs, decides every once in a while to sign players who proved at every level that they couldn’t turn themselves into quality professional players is simply beyond me. But, normally, it’s strictly linked with Hagi who – proved it also as a coach – really believes in his instincts (I cannot call stubborn a man I can’t stop admiring). Signing players like Alibec and Daminuta, whose real talent is to throw away the fantastic opportunities to make a huge career in football, made no sense to me. If Daminuta came on a free and, in theory, might allow Viitorul to make some money, Alibec was signed on loan from Inter, offered the place deserved by one of Viitorul’s kids, and made a mess of it once again. Now he’s warming the bench of Astra Giurgiu, after his probably last loan spell in Serie A, with Bologna. Trying to find a logic in these signings? Maybe Hagi wanted to show his Academy graduates how they must not look like in 2-3 years time. Full of tattoos and full of themselves, with some money in the bank, a flashy car & tarty girl at their disposal. But is that such a bad profile for a 17-18 years olds whose family education stopped at 13-14, when they left home to join the Academy and spent his teenage years among boys, going from training to school and back? Just to prove that “I told you so”, here’s a link on a piece I wrote back in January. Steaua’s U19 and U17 teams were coming after heavy defeats suffered at the hands of Hagi’s Academy and nobody at the club seemed preoccupied about the fact that, in 8 months time, the club’s work at youth level will be exposed in the UEFA Youth League. A competition that’s supposed to act as a platform for young talents, offering them a chance to gain invaluable experience and impress on the European stage, but not for the Romanian champions, who decided years ago that there’s no point in running a decent academy when the owner is rich enough to sign basically any young prospect that makes his way in the top flight and looks promising enough. Hagi’s Academy fuels not just Romania’s youth national teams, but also Romania’s champion club. Toma isn’t that confident that the injection of quality from Hagi’s Academy can boost Steaua’s chances to do well against the likes of Chelsea, Schalke or FC Basel, but, in truth, he does get some promising faces under his command. Alexandru Tarnovan and Ionut Mitrita have already some first league appearances with Viitorul and, for me, take a big risk by giving up the chance to feature in more senior games this term, in Liga I, in exchange for six appearances in the UEFA Youth League. For their sake, the loan deal will allow them to return to Viitorul in the winter, as playing senior football at this age is vital for their development. Also, Robert Hodorogea and Bogdan Vasile are U19 Romanian internationals, and look consistent and reliable, qualities you don’t see that often in (Romanian) players of their age. Steaua also loaned from Targu Mures another good prospect, Razvan Stoica, while in goal they can count on Valentin Cojocaru, who has been training for a while with the senior team and looked close to a deal with Liverpool, not so long ago. Stay in touch with Romanian football on Facebook!